Seismic Research Vessel FA XIAN6, a Rolls-RoyceUT 830 CD design for Shanghai Offshore Petroleum Bureau, (Sinopec), is the first of its type to be built in China. It is equipped with a package of Rolls-Royce power and propulsion systems as well as advanced automated handling systems for deploying the seismic equipment. 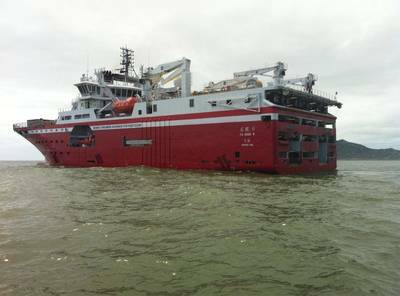 Built by Shanghai Shipyard Co., FA XIAN6 has been delivered to Shanghai Offshore Petroleum Bureau, which is a part of the Chinese conglomerate Sinopec, expanding its current fleet of seismic and geophysical exploration survey vessels. During research missions the vessel will tow up to 14 cables, or 'streamers', each 12 kilometres long. Seismic waves are sent deep into the seabed and the reflected waves are detected by hydrophones spread along the network of streamers. This data is then used to give a detailed 3D profile of the geological features, including the location of oil and gas, often thousands of meters below sea level. Anders Almestad, Rolls-Royce, President - Offshore, said: "We would like to congratulate Shanghai Offshore Petroleum Bureau on the successful delivery of FA XIAN6. The vessel design and advanced equipment on board are developed to meet the high standards demanded by seismic research vessels, enabling the customer to operate safely and efficiently in deep seas. The combination of our vessel design and advanced equipment package make the FA XIAN6 one of the most sophisticated Rolls-Royce vessels at sea."